Best graduating student (2015/2016) session Daniel Kenechukwu Nkemelu with the Vice Chancellor, Prof. Idowu Olayinka flanked by the other Principal officer of the University at the 2017 Convocation Ceremony on Monday, 12 November, 2017. He returned with a perfect Cumulative Grade Point Average of 7.0 out of a maximum of 7.0 and for this great achievement, Daniel is now on a MasterCard Scholarship to Carnegie Mellon University, Pittsburgh, PA, USA for a Masters in Electrical and Computer Engineering. The breakdown of the graduating lists shows that 3.5 percent and 28 percent of the graduating students finished with First Class and Second Class (Upper) Honours respectively. 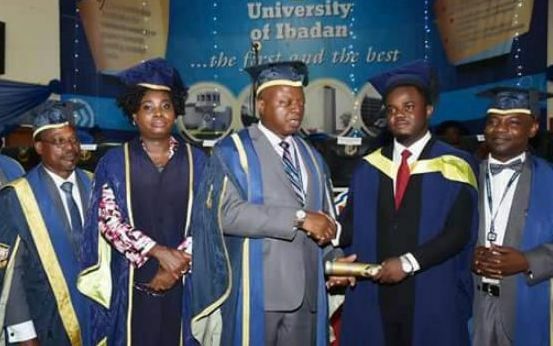 The summary of First Degree Graduands reveals a total of 186 and 1,538 making First Class and Second Class Upper Division respectively, 3, 133 and 434, making Second Class Lower Division and Third Class respectively while 81 made Pass and 257 unclassified. Olayinka said, “I am aware that there have been, of recent, strident public criticisms of the large number of First Class graduates from the universities. I hasten to add that we are exceedingly proud of all Ibadan graduates. We see this phenomenon from the strategic point of view of Input-Process-Output. In specific terms, the University of Ibadan has arguably the most competitive mechanism for undergraduate admission in the country. Only one out of 16 Unified Tertiary Matriculation Examinations, UTME, candidates who made the University of Ibadan their First choice can secure admission here. Our admission process is transparent and merit driven while our Faculty rank among the best in the country in terms of research productivity. Ibadan is for the best and brightest. This has been attested to consistently by the Times Higher Education World University rankings in which Ibadan is the only University in the country ranked among the topmost 801-1000 universities in the world. It may be worthwhile to mention in passing here that, as shown in table 2, in the United Kingdom, comparative figures from the higher Education Statistic Agency indicated an average of 23.6 percent of their students earning First Class and 49.6 percent obtaining Second Class Upper degree at the end of the 2015/2016 session”. Continuing, “Among the main highlights of today’s event is that the University of Ibadan is producing the pioneering set of B.A. Music graduates, comparing 12 students one of whom earned a First Class Honours. It is gratifying to note that the Department of Music had earlier secured full accreditation from the National Universities Commission, NUC. 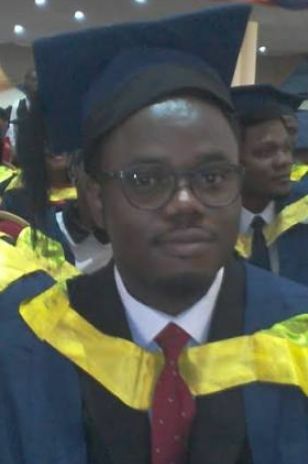 Olayinka disclosed that the Premier University has conformed with the new grading system from the NUC for undergraduate programmes starting with the institution’s current 100 level students pointing out, “The implications of this include 45 percent as the pass mark for all courses in the faculties operating the Course System, the abolition of Pass degree, and a transition from a 7-point grading systems to a 4-point grading system”. Among the impressive feats boasted of by the Vice Chancellor include: two students, Amida Tella and Oluyemi Ajiboye graduating with First Class Honours at the recently released Final Bar qualification examination 2017 of the Nigeria Law School.